Learn how to create a game like Tiny Wings with Cocos2D 2.X in this tutorial series – including dynamic terrain generation and game physics! Update 5/18/2013 Fully updated for Cocos2D 2.X. (original post by Ray Wenderlich, update by Ali Hafizji). Tiny Wings is an extremely popular game by Andreas Illiger involving a bird who tries to fly by catching a ride on hills. At first glance, the gameplay of Tiny Wings looks very simple, but there are a lot of tricks going on under the hood. 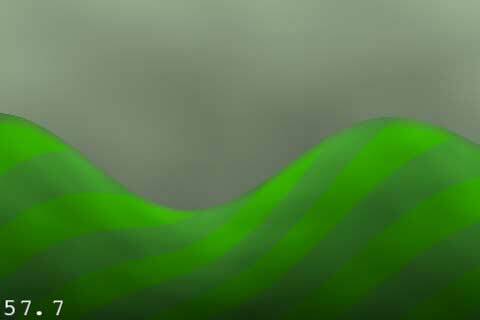 The hills and their textures are dynamically generated, and the game uses Box2D physics to simulate the movement of the bird. Due to the popularity of the game and the cool technical tricks within, a lot of developers have been curious about how things are implemented. 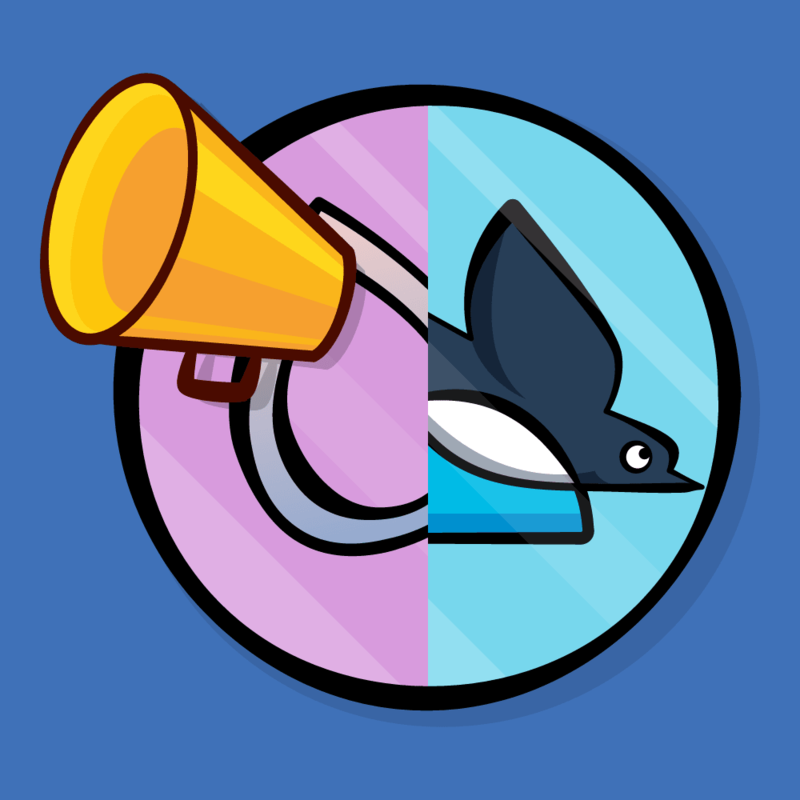 This tutorial series is based on an excellent demo project written by Sergey Tikhonov that demonstrates how to implement some of the trickiest features of Tiny Wings. Thanks Sergey! Prerequisite: First review the How To Create Dynamic Textures with CCRenderTexture in Cocos2D 2.X tutorial, which shows you how to create the hill and background textures you’ll be using in this tutorial. Part 1: You are here! 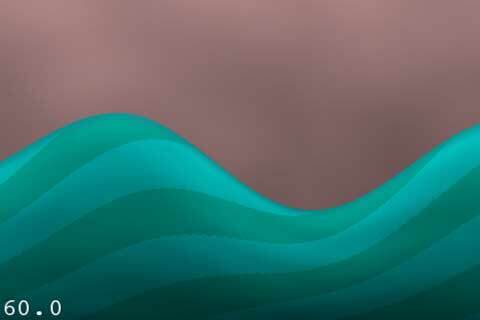 This part will show you how to create the dynamic hills that you’ll need for a game like Tiny Wings. Part 2: The second part will show you how to add the Box2D gameplay that you’ll need for a game like Tiny Wings. 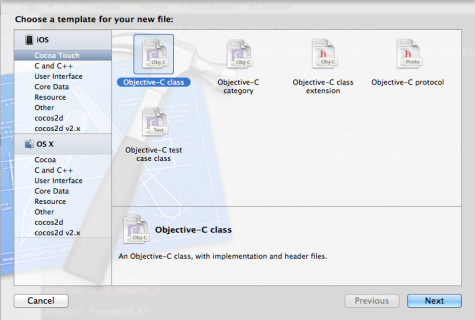 This tutorial assumes you are familiar with Cocos2D. 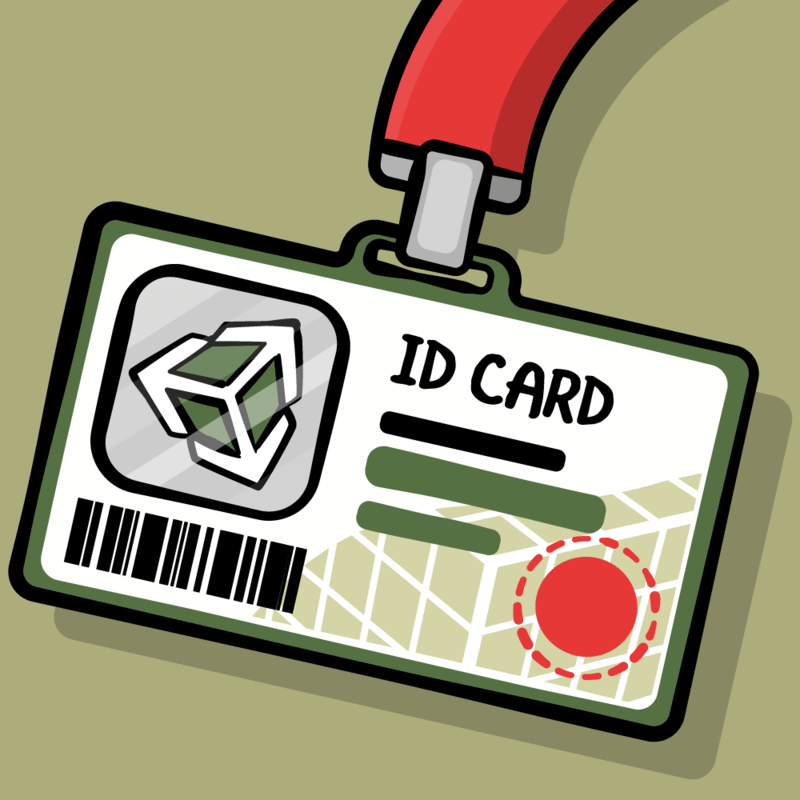 If you are new to Cocos2D, you should check out some of the other Cocos2D tutorials on this site first. If you don’t have it already, download the sample project where you left off in the previous tutorial. Next, create a class for the terrain by going to File\New\New File, choosing iOS\Cocoa Touch\Objective-C class, and clicking Next. Name the class Terrain and make sure it it a subclass of CCNode. Click next and create the file. Next you’re going to start implementing Terrain.m. I’m going to explain it step by step, so go ahead and delete everything currently in Terrain.m and add the following code section by section. 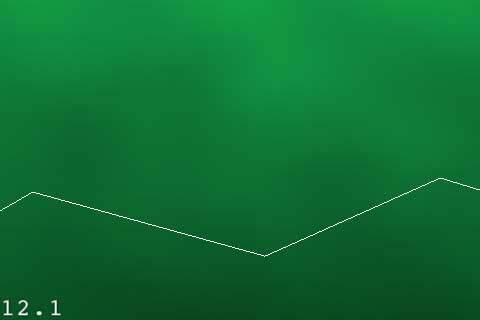 This declares an array called _hillKeyPoints where you’ll store all of the points representing the peak of each hill, and an offset for how far the terrain is currently being scrolled. Next add the following method in the implementation section.  This is a method to generate the key points for some random hills. This is an extremely simple implementation just so you can have a starting point. The first point is the left-side of the screen, in the middle along the y-axis. Each point after that moves half the width of the screen along the x-axis, and is set to a random value along the y-axis, from 0 up to the height of the screen. The init method calls generateHills to set up the hills, and the draw method simply draws lines between each of the points for debugging, so you can easily visualize them on the screen. 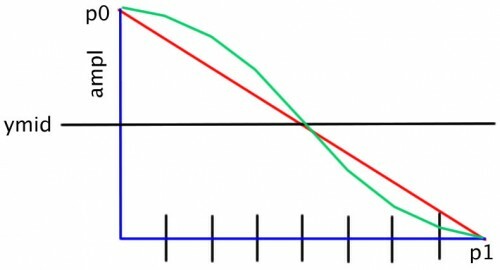 Think about how the terrain moves - as our hero advances along the x-axis of the terrain, the terrain is sliding to the left. So we have to multiply the offset by -1 here - and don't forget to take into consideration the scale! 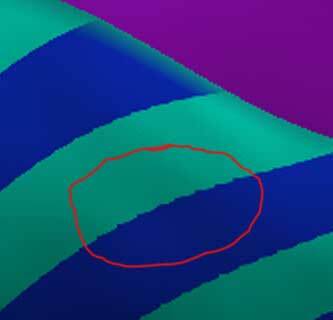 Note this sets the stripes texture on the Terrain to a new random stripes texture each time you tap, which is handy for testing. Also, when calling setTextureRect on _background in update, you might wish to multiply the offset by 0.7 to get the background to scroll slower than the terrain. As you watch your hills scroll by, you'll probably realize pretty quickly that these wouldn't work very well for a Tiny Wings game. Due to picking the y-coordinate randomly, sometimes the hills are too big and sometimes they are too small. There's also not enough variance in the x-axis. But now that you have this test code working and a good way to visualize and debug it, it's simply a matter of dreaming up a better algorithm! You can either take a few moments and come up with your own hill algorithm, replacing the code in generateHills, or you can use Sergey's implementation, shown in the next section! Except: reverse the y-axis offset every other time. Start offscreen to the left, and hardcode the second point to (0, winSize.height/2), so there's a hill coming up from the left offscreen. Compile and run, and now you'll see a much better hill algorithm, that looks like maybe a properly motivated seal might be able to fly off these! Before you go much further, you need to make a major performance optimization. Right now, you're drawing all 1000 key points of the hills, even though only a few of them are visible on the screen at once! Here you loop through each of the key points (starting with 0) and look at their x-coordinates. Whatever the current offset is set to, maps to the left edge of the screen. So you take that and subtract the winSize.width/8. If the value is less than that, you keep advancing till you find one that's greater. That's your from keypoint, a similar process is followed for the toKeypoint. Now instead of drawing all of the points, you only draw the visible ones by using the indices you calculated earlier. You also change the color of the line to red to make it a bit easier to see. 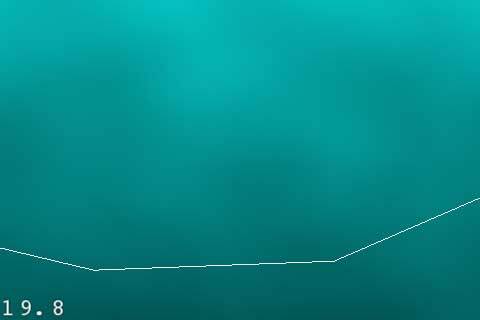 Compile and run your code, and you should see the line segments pop in when it is time for them to be drawn! So far so good, but there is one big problem - those don't look like hills at all! In real life, hills don't go up and down in straight lines - they have slopes. But how can you make your hills curved? Well one way to do it is with our friend cosine that we learned about back in high school! Note: This tutorial covers the basics of trigonometry that you need to know to make this game, but if you'd like to learn more, check out our Trigonometry for Game Programming series! So it starts at 1, and every PI it curves down to -1. First, you need to draw the line in segments, so you'll create one segment every 10 points. Similarly, you want a complete cosine curve, so you can divide PI by the number of segments to get the delta angle at each point. Then, you'll want to map cos(0) to the y-coordinate of p0, and cos(PI) to the y-coordinate of p1. 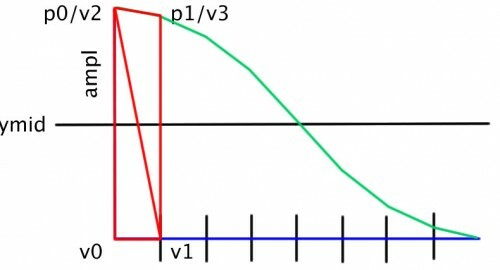 To do this, you'll call cos(angle), and multiply the result by half the distance between p1 and p0 (called ampl in the diagram). 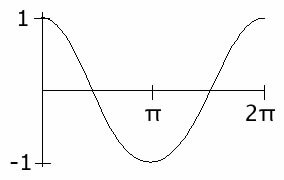 Since cos(0) = 1 and cos(PI) = -1, this gives us ampl at p0 and -ampl at p1. You can add that to the position of the midpoint to give you the y-coordinate you need! This runs through the strategy we outlined in the diagram above. Take a minute and think through the code and make sure you understand how this works, because you'll be building on this from here. Compile and run, and now you should see a curvy line connecting the hills! 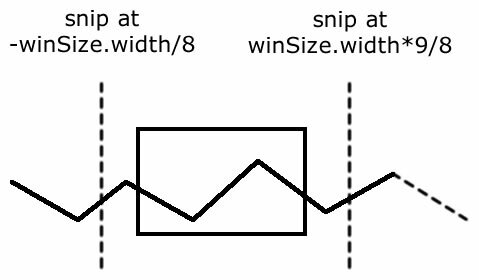 Now that you know how to get the curve representing the top of the hill, it's fairly simple to write the code to draw the hill using the striped texture we generated in the last tutorial! You'll also set the texture coordinate at each point. 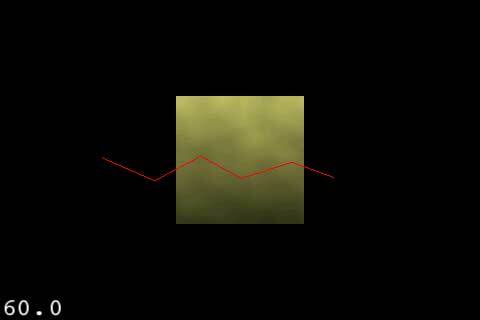 For the x-coordinate, you'll simply divide it by the texture's width (since the texture repeats). For the y-coordinate though, you'll map the bottom of the hill to 0 and the top of the hill to 1, distributing the full height of the texture along the strip. Much of this will look familiar, since I already covered it in the previous section when drawing the hill curve with cosine. The new part is you're now filling up an array with the vertices for each segment of the hill, as explained in the strategy part above. Each strip requires four vertices and four texture coords. This binds the stripes texture as the texture to use, passes in the array of vertices and texture coordinates made earlier, and draws the arrays as a triangle strip. 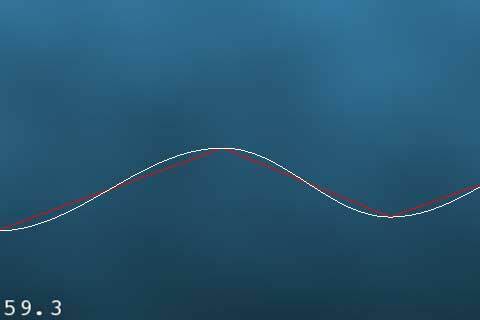 Compile and run your code, and you should now see some awesome looking hills! Some people in the Cocos2D forums seem to indicate that you can get this problem to go away by adding more vertical segments (instead of the 1 segment we have now). By reducing the width of each segment, you force the code to generate more segments to fill the space. Run again, and you'll see your hills look much better! Of course, the tradeoff is processing time. Next check out part 2 of this tutorial, where finally we'll add some gameplay code so you can make one lucky seal start to fly!